Scott Triphahn, Flyte Systems vice president, said, “Starwoods new Aloft and Element dual concept appeals to the new generation of travelers that values edgy, high tech, and health-focused experiences. FlyteBoard is a perfect complement to the unique amenities today’s travelers want. These brands offer guest service amenities like Starwoods’ new Botlr robotic butler guest service amenity delivery system.” Flyte Systems is a leading provider of airport travel information displays and digital signage content for hotels, corporate training centers, convention centers and related businesses. 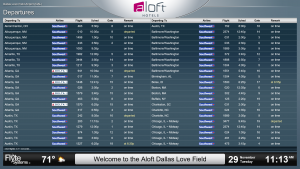 “The Dallas Love Field Aloft and Element properties will be the first in Texas to offer Starwoods’ new automated Botlr,” Elmore said. Botlr is an autonomous guest delivery ‘robot butler’ that guests can call to have amenities delivered to their rooms. “Botlr is the type of leading edge technology our guest will appreciate and enjoy.” The properties will also offer amenities that include free airport shuttle service, fitness center, and bicycle rental. 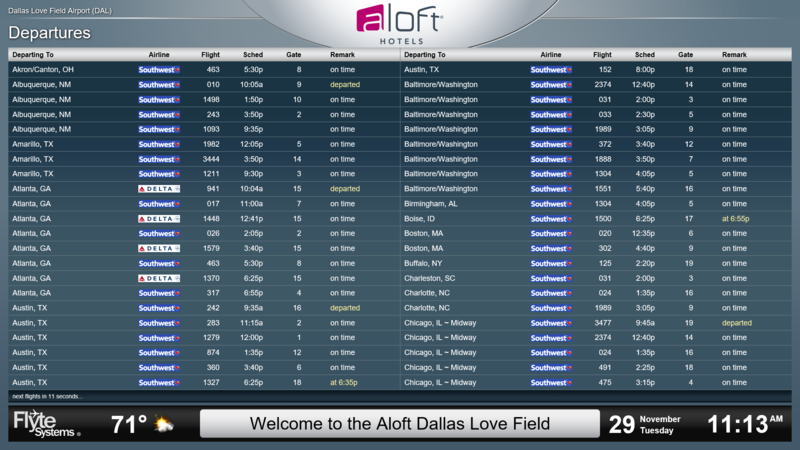 The Aloft and Element hotels have 7,200 feet of meeting space, a pool, and Aloft’s W XYZ bar.